The Media Library module is a centralized file storage. Once the Administrator has uploaded files to Media Library, various system modules get access to these files. 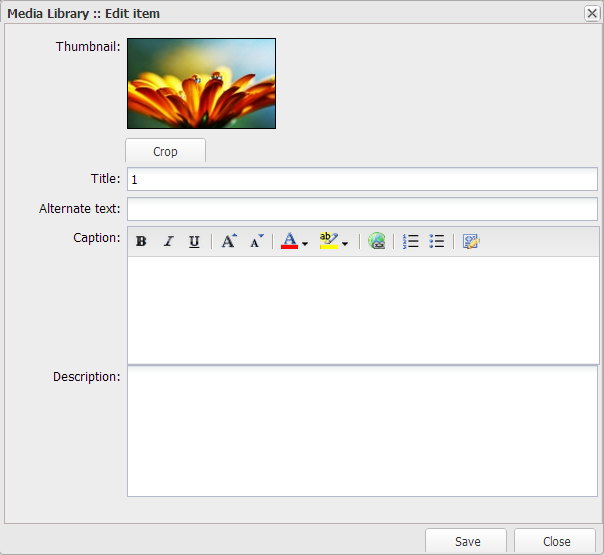 For instance, a text editor can insert images or links to files from Media Library. It is necessary to remember that Media Library doesn't not grant access to files, neither does it regulate this process. Having been uploaded, files are available by direct links. Besides, there is a list of permitted formats, which is limited and, therefore, recommended to be aware of under the 'Permitted formats' link in the File Uploader window. the Extended Uploader, which is based on cutting-edge technologies and allows to upload several files at a time displaying the file's thumbnail before the upload as well as the uploading process itself. When uploading images to Media Library, the system cuts their thumbnails of different sizes. 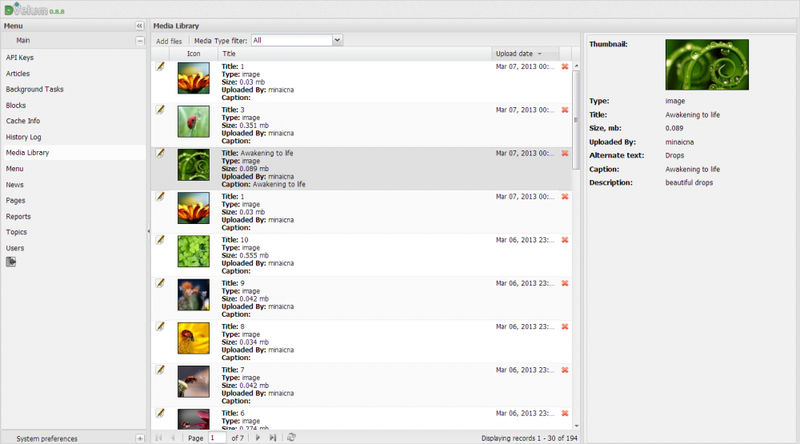 The number of thumbnails and their sizes are set by the developer/ administrator of the system in the production mode. If needed, thumbnails may be cut again on one's own (see below for details). The names of thumbnails differ from those of the original files by a postfix. For instance, if you upload the file picture.jpg, there will be created the following thumbnails: picture-thumbnail.jpg, picture-medium.jpg etc. 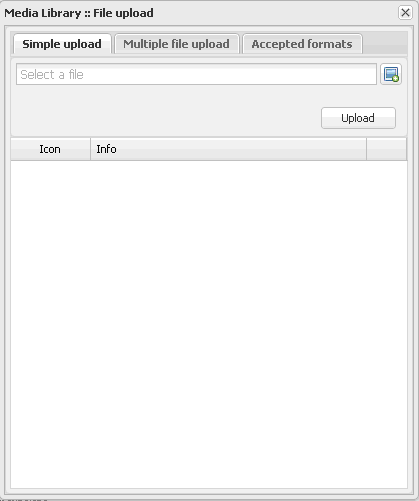 a field showing short information on the media file (icon, name, size (Mb), profile name of the user, who has uploaded the file, alternate text, caption, description). 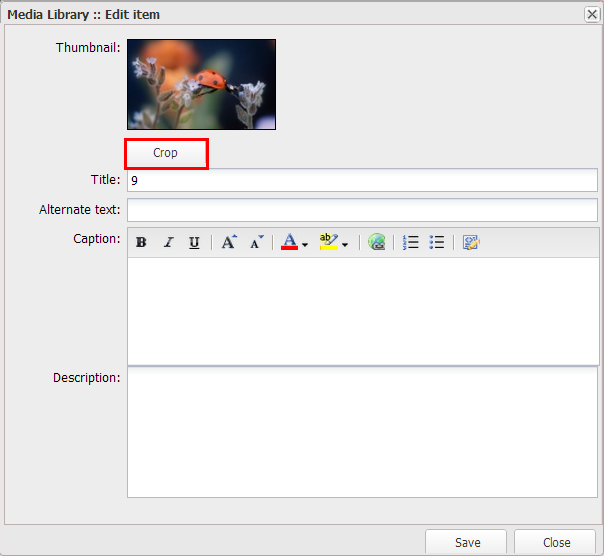 A new file is added to the Media Library by clicking ‘Add files’ button, which opens an upload form. 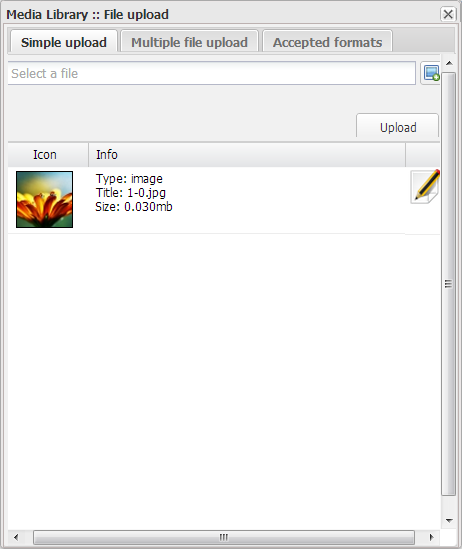 Accepted formats – contains the list of file formats (file extensions) available for upload. To add a file, click the ‘Select a file’ icon and choose a file in the dialogue box, then click the ‘Upload’ button. After that, the information on the file uploaded will show at the bottom of the form. The information includes the file’s thumbnail, type, name and size. The ‘Edit details’ button is situated next to the uploaded file. After filling in the form, save file details clicking the ‘Save’ button. 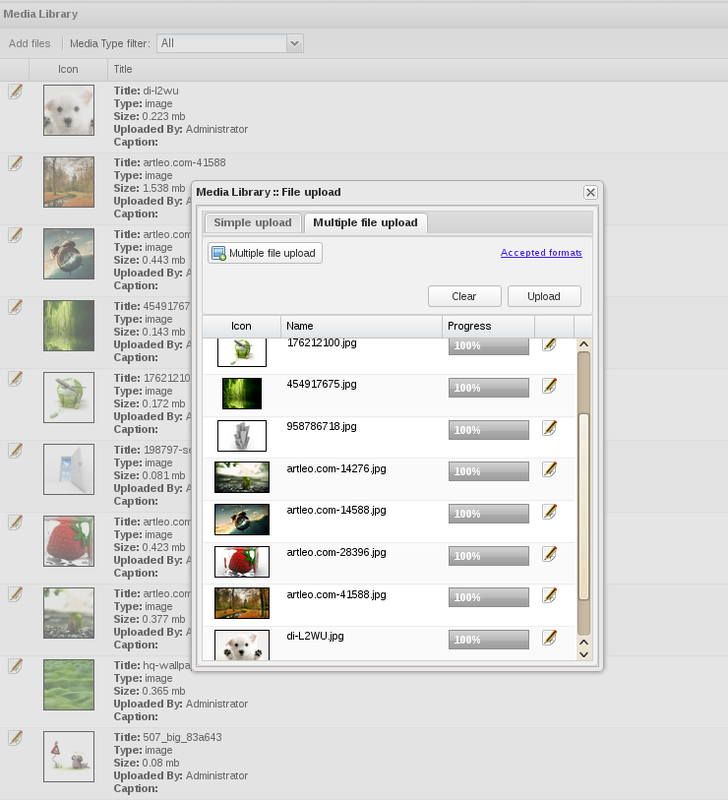 While uploading an image to the Media Library you will also see the ‘Crop’ button appear in the ‘Edit file’ form. Clicking the button will open the ‘Crop image’ form (learn more about modifying images in ‘Image cropping’ section). To add several files to Media Library simultaneously, click ‘Select files’ button to choose several files in the dialogue box and click Open. The selected files will show listed in the form and may be removed with the help of ‘Clear’ button. To upload the selected files to the Media Library, click Upload. The tab defines the maximum upload file size and accepted file formats for each type of files. The form will show a full size image. On your right you will see a dropdown list offering various image sizes with an immediate preview of the just resized image below. 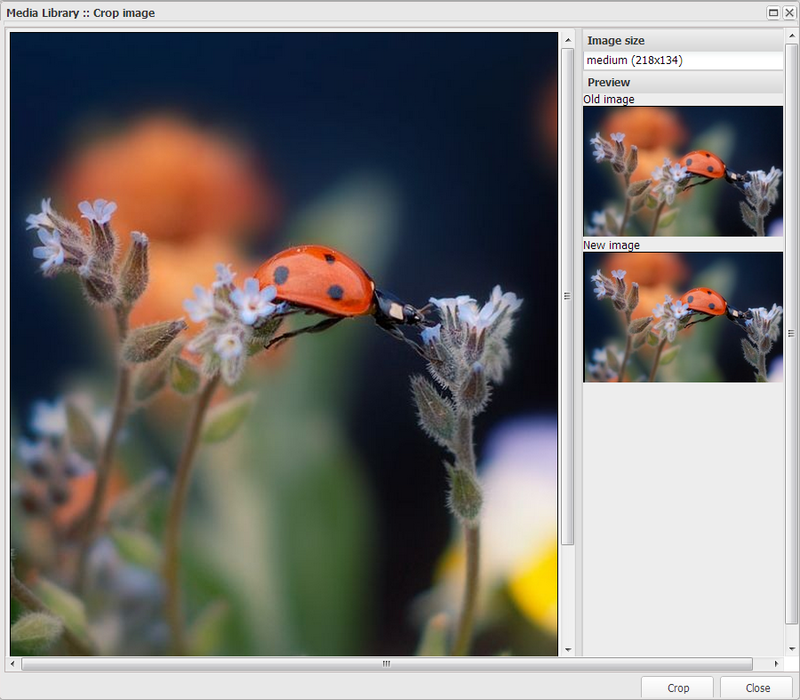 The system also offers the image size ‘large’ (640x480), however, it is not available for automatic cropping. The list of sizes depends on the system settings and is modified in the Media library Config section, and thus, may differ from the above mentioned one. 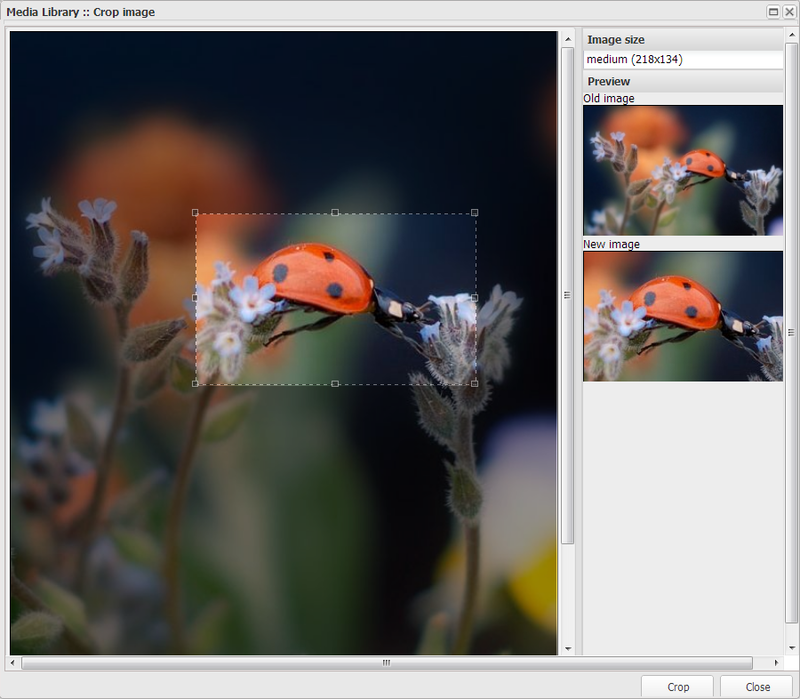 To proceed with cropping, left click the mouse and drag over the image holding the left mouse button down till you select the image area you would like to keep. Click Crop.